Rob Edmunds III has a Bachelor of Science degree in Mathematics and Business from Villanova University. Involved with many facets of the gaging industry, he also participates in national and regional industry associations. Currently vice president of Edmunds Gages, he can be reached during normal business hours at Edmunds Gages or via email at REdmundsIII@edmundsgages.com. Gage blocks can vary greatly in accuracy and are usually classified in three grades. The following chart indicates standard gage block tolerances for 1-in. blocks in microinches. Traceability is the term most commonly used to describe the calibration "link" – indicating the degree of closeness or directness a particular set of gage blocks has to the standards established by NIST. For example, if a set of gage blocks is sent directly to NIST for calibration (a costly affair), it can be said that that particular set is directly traceable or directly linked to NIST. If the same set is sent to ABC lab, whose gage block master set has been calibrated by NIST and ABC's master gage block set is used to calibrate the set in question, traceability to NIST also exists – but the set in question lacks direct traceability to NIST. This lack of direct traceability doesn't necessarily indicate that ABC's calibration is inadequate, in fact, it could be quite good, but means that it's one step away from direct traceability. As a general rule, the less direct the link to NIST, the more susceptible calibration readings will be to dispute should a correlation question arise. Most quality metrology labs send at least one set of gage blocks – often referred to as a "grandfather" set – directly to NIST for calibration. As you have probably already surmised, gage blocks are used primarily for comparative measurement – where the size, length, or dimension of a particular object is determined by comparison to a calibrated standard. Whether used as a standard to check other gage blocks, other fixed limit standards, or customer parts on the shop floor, gage blocks form the basis of how size is defined in a broad spectrum of applications. 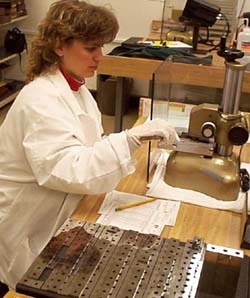 A technician uses a gage block comparator – an ultra-precise instrument that provides true point-to-point measurement – to calibrate a standard set of gage blocks. Once you're familiar with stacking and wringing, there are three gage block preparations steps you should take each time you're going to make a measurement. Using clean and demagnetized gage blocks is paramount. A gage block that has grease or grime on it will yield an inaccurate reading. Most clean-up jobs can be accomplished by wiping each block with a soft, lint-free cloth moistened with mineral spirits. You must also demagnetize all blocks that retain a magnetic field. Good electronic demagnetizers and gauss gages are common catalog items today. Gage blocks require good overall geometry to measure accurately. Nicked, burred, or scratched measuring faces will not wring together well and most likely provide anomalous readings. Deburring the measuring faces of steel gage blocks by lightly "swiping" them along the face of a clean, flat, serrated, Arkansas, or granite stone is ideal, while using clean mineral spirits as a carrier. This procedure, if performed correctly, will not hinder the quality or integrity of the gage blocks. Note that different block materials will require other types of deburring stones. Environmental factors such as temperature and humidity will affect the actual size of any material and are the two largest factors contributing to measurement inaccuracy. Temperature and humidity can be especially damaging to measurement accuracy when using two different materials in your measurement application. For example, if the gage blocks are steel and the part being measured is aluminum, thermal expansion or contraction will cause the two materials to move at different rates of speed. If the temperature is fluctuating as well, the problem is compounded. When measuring to millionths in a true metrology lab, the temperature of the room, and all its contents, is set at 20¡C and is held within 0.25¡C. Ted Doiron, a physicist in the precision engineering division at NIST, often refers to something he calls Doiron's Law of Dimensional Metrology: "The guy with the best thermostat wins!" It's simple, but very true: in millionths measurement, temperature is usually the biggest contributor to measurement error. Although gage blocks look so simple – just like a plain slab of steel – they are so important to the quality industry. You might say they're the building blocks of all measurement, from loose measurements taken in the shop to less than millionths of an inch done in a lab. Author's note: Metrologist Walter Lehmus was very helpful in the preparation of this article. Although gage blocks are quite familiar to metrologists, there are still misconceptions and considerable misuse in the field. With that in mind, this article will serve as a refresher in the basics of gage blocks. In early medieval times, the aristocracy in England experienced an almost continual stream of domestic discontent due to the occurrence of property line disputes. When a nobleman wanted to sell or rent a parcel of his land, he would often demarcate the relevant property boundary by pacing off the particular distance in question heel to toe. So, depending upon foot size, individuals invariably would arrive at vastly different opinions on how many "feet" constituted a particular property border. Attempting to end the continual squabbling that accompanied such an imprecise system of measurement, the King resolved to create a standard system of measurement based upon – what else? – his own foot. Today, "the foot" is one of the most commonly used units of measurement in the U.S. and endures as a measurement standard. Though any standard would have sufficed, the King had one thing the other noblemen didn't – the authority to establish a standard. In the U.S. and its territories, the National Institute of Standards and Technology serves as today's modern measurement standards "King." A division of the U.S. Commerce Department, NIST is the last word in measurement standards in this country and serves as the final judge and jury through its establishment of length standards for modern day industry. No longer the King's foot, gage blocks reign supreme in establishing a length standard for modern American industry. Metrologists have used gage blocks for more than 85 years, yet the devices haven't changed tangibly in design, application, or even accuracy in the past 70. While gage blocks are simple compared to most types of sophisticated gaging today – they are comprised of square, rectangular, or round shapes (manufactured of steel and other materials) and have flat and parallel opposing sides manufactured to particular sizes – they remain the industry standard for length and form the backbone of almost all modern gaging applications. Stacking gage blocks involves choosing the right combination of blocks to simulate, as closely as possible, the nominal size to be measured. The most common gage block set is comprised of 81 pieces and ranges in size from 0.050 to 4.00 in. In making a setup – when gage blocks are stacked side to side to establish a particular length standard – the goal is to use as few gage blocks as possible because each "wring" (where one gage block face meets another) adds some deviation or inaccuracy to the setup. For example, if the setup is for 2.8763 in., begin with the digit farthest to the right. Your first block will be 0.1003 in. Again, working from the right side, the next block will be 0.126 in., then 0.650 in., and finally add the 2-in. Now you have 2.8763 in. It's simple! Wringing gage blocks together, which means combining them end-to-end to add their measurement values, is the real key to accurate gage block setup and use. However, it's also the most misunderstood concept. The phenomenon of wringing gage blocks so they seem to "stick together" occurs for two reasons. First, there's an adhesive action because of the ultra-thin film of oil or moisture between the blocks. Second, there is also a molecular attraction or bonding between the blocks because of very flat and parallel mating surfaces. That's why the better the block geometry, the better the wring will be. 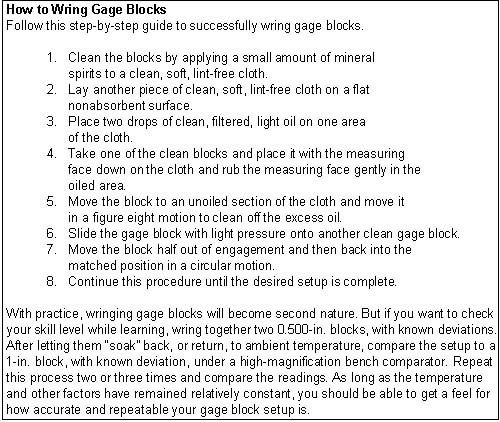 (See sidebar, How to Wring Gage Blocks).